Floats For Steelhead: Is There A Difference? 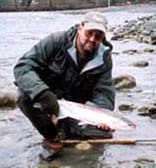 Float fishing for Steelhead is easily the most popular method of angling for winter Steelhead in southern B.C. and Vancouver Island. Float fishing is the type of technique that if done well is very productive but if done poorly, float fishing can be very frustrating and unproductive. The old adage 10% of the fisherman catch 90% of the fish is certainly true as far as winter Steelhead float fishing is concerned. Why then, are certain anglers consistently successful year after year and what sets them apart from the masses of other anglers who only catch the occasional Steelhead? First you need to learn the basics of Float fishing, how to set up your gear, how to read water, how to cover water and learn when the Steelhead are running. Some anglers however have taken the basics and brought them to another level. Close attention to the details of every aspect of you gear and angling approach is what makes the difference. When you think about it basically we are all using the same technique, attention to the little details is the difference. One of the most overlooked details about float fishing is the Float! This important piece of your Steelhead tackle is your window to the Steelhead. I see countless anglers spending hundreds of dollars on there rods, reels, waders, vests, etc yet to spring for more than $0.99 on a Float you think that they were donating an important appendage or something. Will putting on an expensive float turn you into Steelhead guru? Not likely, but this is one detail that can easily be upgraded and the benefits will be seen immediately. A quality float will track better in the water and will be immensely more sensitive, not only that they cast and retrieve with less effort, something to consider when you think about how many times you cast and retrieve in a single days fishing. Also this is the one piece of you tackle that you will be staring at all day so it should be something worth looking at! Steelhead floats come in all shapes, sizes, and colors and are made from a variety of materials. Finding the one that suites you best will take a little experimenting but all good Steelheaders are always experimenting with their tackle, trying to improve on those little details that in themselves don't add up to much but when added together with the right mindset will make you a consistently successful Steelhead angler. Steelhead floats are made from a variety of different materials like foam, cork, balsa wood and plastic which are all used in the construction of the various styles that are on the market today. The most popular and least expensive are the foam "dink" floats. These floats are available in several sizes and many colors. There are two distinct types of foam floats on the market both are used the same way but the type of foam is what differs. Some floats are made from hi-density foam and others are made from low-density foam. In my experience the low-density foam floats are more sensitive and fish better than then hi-density foam floats. Foam floats also come in a variety of colors, lighter colors such as light gray or light green are better than darker colors such as dark blue or black as the lighter colors are less visible to the fish in low clear water. Cork floats have been around forever, these were the first floats used by the early Steelheaders in the good old days. Cork floats still have a strong following today. These floats will hold more weight than many other styles and also have more mass so they can be an advantage where casting farther distances is important. Cork float also have good sensitivity and fish very well in most conditions. Many die-hard Thompson River Steelheaders still swear by cork floats. Cork floats however don't come cheap expect to pay between 3 to 6 bucks for one of these classic traditional floats. Balsa wood floats have probably been around as long as cork floats and still remain quite popular. Balsa wood is very light and very buoyant. Balsa floats fish very well and are very sensitive. Most Balsa floats are finished with lacquer and various wood stains so there are very appealing to look at and are a pleasure to fish with. Balsa floats are also a little pricey most costing between 4 and 6 dollars. The european clear drennan plastic floats have sure made their mark on our local Steelhead fishery. These floats are the ultimate in stealth and sensitivity. Hi-tech drennan floats however come at a price 6 to 7 bucks a float. Personally I consider these floats to be the ultimate Steelhead float. The clear drennan floats are just the ticket for clear water conditions and fish that are soft biters. Regardless of the material that the float is made from the shape of a float will also affect the way in which it performs. Long slender floats are more sensitive and track very well, where as short fat floats will hold more weight but also have more drag and are not quite so sensitive. Chose the float that best suites your particular application. A common mistake many anglers make is that they use to big a float or they do not weight the float down properly. 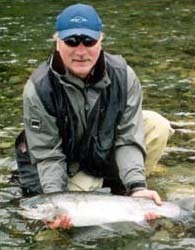 Steelhead floats should be set up so that 3/4 to 7/8 of the float is under water. Floats that ride too high in the water are hard to read and do not track properly making for poor drifts and missed bites. Float fishing for steelhead is a very challenging and exciting way to angle for these very special fish. Float fishing successfully on a consistent basis can take years to master and I am not sure that anyone really ever does, but the pursuit and the challenge of being one of the anglers that is in that top 10% is a goal that will always keep you coming back!